Known for her welcoming, friendly style, Ashley has adjudicated local competitions and National Championships in the United States and Canada. She certified as an instructor and adjudicator through the North American Irish Dance Federation, where she established their grade exams. After a competitive career which included teams at the Oireachtas, she ran the Triallta Irish Dance Company for almost ten years. Ashley ran Diochra.com: Irish Dancing Online for thirteen years, including the popular Irish dance trivia game Webfeis. She’s trained primarily in the modern CLRG style, but also has taken workshops run by CRN and FDTA (Festival) trainers. Historical styles, sean-nós, social céilí — it’s all a joy. She loves seeing dancers of all ages succeed by achieving the goals they’ve set for themselves. Sharon has traveled throughout the United States and Europe judging open platform competitions and championships, running workshops, and creating opportunities for Irish dancers and instructors to perfect their craft. Sharon won numerous local, regional and national championships during her competitive career, qualified regularly for the World Championships, and performed at Carnegie Hall under the tutelage of the McNiff family. 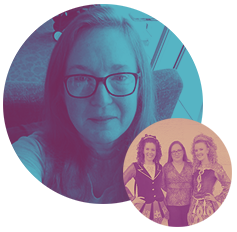 Sharon taught Irish step, Céilí and sean-nós through the Achill Academy of Irish Dance for over ten years, guiding students to reach their own goals, and proudly brought dancers to open platform North American, European and World Championships. She was a local, National, and World-level ADCRG for the North American Irish Dance Federation and the World Irish Dance Association. A former mathematics teacher and University professor, Sharon is a Ph.D. Candidate in the Instructional Design and Technology program at the Virginia Polytechnic Institute and State University. Implemented 2019: As a part of their ADCRG certification process, ADCRG Candidates may adjudicate Beginner through Novice solos and small team dances only. After a successful run as a CLRG World Championship solo dancer, Brittany certified as a teacher with NAIDF and later remained certified under WIDA (now independent). Experienced in coaching dancers to high standards, Brittany has taught multiple title-holding dancers at National and International levels, has attended official Festival workshops, and has adjudicated independent feiseanna. Brittany brings with her a background strong in experience with different educational systems: public, private, and homeschool. She lived briefly in County Mayo, Ireland. Dedicated to enriching young lives, Brittany also teaches English at a Christian academy. 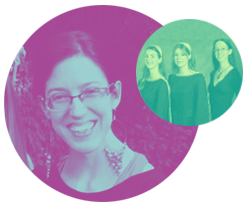 An early convert to open platform in North America, Patricia Silver certified as a céilí teacher and an adjudicator for lower levels and teams under the North American Irish Dance Federation (completing a portion of the ADCRG), and later remained certified as a céilí teacher under WIDA (now independent). Patricia has adjudicated for many years, under NAIDF as well as independently, at local feiseanna and National Championships with her specialities focused on team dancing and the early solo levels. Under her tutelage, her dancers have earned numerous titles locally, nationally, and internationally. Charmaine Forbes is an independent Australian adjudicator and grade examiner, having judged open platform feiseanna in that country since 2010. She danced at the State and National Championships in Australia in solos and teams for over 15 years, has trained dancers for local competitions up to Open level, and coached teams for State and National Championships. We’re very pleased to get an Aussie perspective on our team, and hope to continue to expand internationally as Digital Feis grows. With an extensive background in Irish dancing, ballet, and ballroom, Brandan Tell Newman has been teaching dance for the past 16 years. She danced with professional companies in Las Vegas including the Las Vegas Civic Ballet, and with famous artists such as Frank Patterson, The Wild Celtic Boys, and Paul Anka. Brandan performed in many of the popular Las Vegas venues such as the Bellagio and House of Blues. Brandan has a B.S. in Elementary Education from the University of Nevada—Las Vegas and is a former school teacher. Chelsea Gonzales runs Aistear Academy, a distance Irish dance school, from her RV! She is also the founder and director of the Oklahoma Academy of Irish Dance, has over 12 years of Irish dance teaching experience, and has adjudicated independent feiseanna. She competed very successfully at the Championship level in her teen years before pursuing teaching. Her students have traveled to competitions across the nation, winning awards at each and every one. A homeschooling and roadschooling advocate, Chelsea is currently having adventures around the United States with her family. All adjudicators who also teach may not judge their own students, and will only be assigned competitions with dancers who are not in their school, who have not attended their school for six months, or who have not attended a workshop given by them in the past six months.